Stoke City manager Mark Hughes has praised Osaze Odemwingie after he scored the only goal in their 1-0 win over Hull City on Saturday. Odemwingie intercepted a cross field pass from Hull's Ahmed Elmohamady, before dashing forward and firing past the opponent's goalie to grab he only goal of the game. 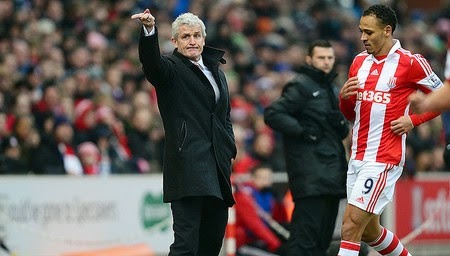 "We have needed the threat in behind and Peter Odemwingie gives us that," Hughes said after the game. "He ran through the middle and capitalised on the errant pass. He has hit the ground running and done well for us. Our intention was to get into the top half and we are in a good position now. We are going to try and go for it." Hughes however gave credit to Hull for keeping his side at bay in the first half, but maintained that his team were the better side, and thus deserved the result on the day, having created better chances. "We deserved the results, made the better chances but we didn't have the spark in the first half. That was a credit to Hull because they came and defended well. "When we got the goal lead, we were quite comfortable. We have won four in five which is good at Premier League level."